I was nearly completed with the painting, which had progressed rather quickly, when I looked up and saw an unusual light flickering above Montecito. It was a brilliant orange-red and I knew immediately there was a fire in the foothills. 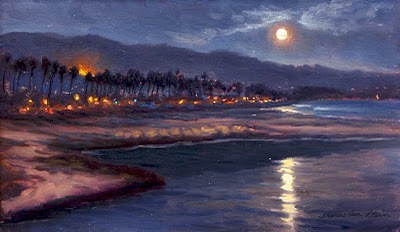 So, there I was, by myself, witnessing the beginning of one of the worst fires to strike Santa Barbara up to that time. I didn't know what to do so I called to some people walking along the bike path to take notice, which they did. (I didn't want to be the only witness). I went back to my painting and added the flames in the precise location where they existed. Later on that eventing the smoke plumes glowed orange from underneath near the flames, and the full moon showed a light blue glow on the top side of the smoke plumes. Unfortunately I didn't paint this visual phenomena but instead went up to my friend and patron's house in Montecito. I helped him to pack up his large collection of art; (mostly mine), in case there would be a need to evacuate from the flames.